It is a well known phenomenon that groups of professionals and specialized trade workers create a guild, with the intention of limiting competition and serving their own financial interest. Guilds do their best to retain the status quo and deliberately mount obstacles in the way of newcomers trying to enter a specific field of employment. This phenomenon existed for the last few centuries and served to enrich guild members very well, many times by recruiting governments to their aid. However, it is not clear if society at large is a beneficiary of this protectionist and restrictive concept and if restricting competition is a worthy cause for maintaining a viable economy in this day and age. Man Fined $500 for Crime of Writing 'I Am An Engineer' in an Email to the Government. I suggest for all of you to read the original article (see link below) and draw your own conclusions. In summary, Mats Järlström, a private citizen with electrical engineering education, has written a well formed letter to his State Government. The letter specified facts about the shortcomings of traffic lights operations, providing important actionable information. 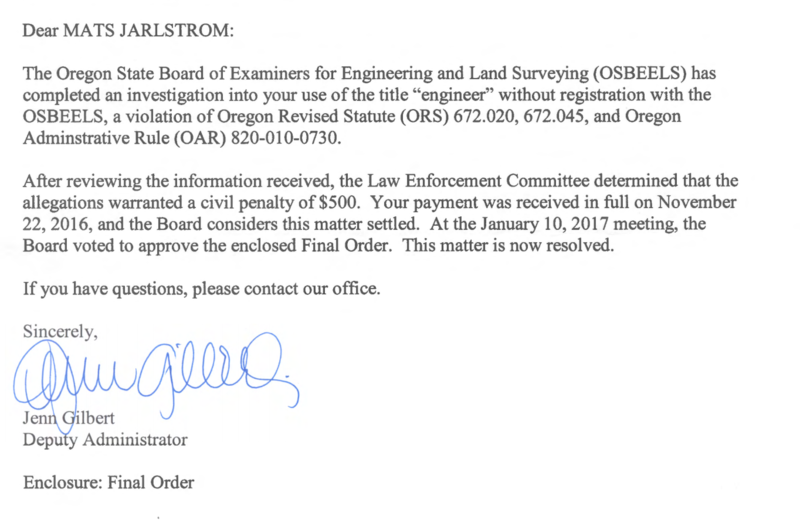 Instead of responding to the good intentioned letter and fixing the problem, the State of Oregon, chose to pick on this Good Samaritan and nail him with a $500 fine for an obscure law violation. The State of Oregon claimed that Mats violated the law by declaring that he is an engineer, while he is not registered with the State. Clearly, the State of Oregon is protecting the special interest of the old guilds through its actions and you can bet on entrenched interests doing their best to keep this situation forever. In these times, when innovation and science are open for all and new disciplines of engineering are opening up, the State of Oregon, in its official policy, is doing its best to keep us tied to the horse and buggy days and perhaps to the revival of the fur trapping and timber logging economy. Ancient regulations that do not keep up with the times, do not advance the interests of Oregon economy and will not create new jobs. There is a good reason for the multi-billion budget deficit that the State of Oregon is facing for the next bi-annual budget, in spite of the high personal tax rates that the state treasury is collecting. The reason is the high cost of government. Part of this cost is apparently being spent on protecting the entrenched guilds constituency and the out of date policies of the pre-industrial revolution. For all of you who declare yourselves as "software engineer", or "electronics engineer", or "biochemical engineer", beware! The State of Oregon is coming to get you. Due to a schedule conflict, this meeting has been cancelled. It will be rescheduled later in May. A general meetup, catch up with old friends and help the new class of 2017. Show up when you can, and catch up with old friends. Help new members work through their layoff. Plenty of time for 1:1 discussions. Closer to downtown PDX for those in that area. Host Anne Meixner is setting something up, and we will post that information. Several of the Intel Eliminati have heard from their colleagues and friends that the 2017 cuts started this past week of April 3. This coincides with the annual performance reviews, known internally as "Focal Review". At the same time, many of the Eliminati continue to receive recruiting requests for both full-time and contract positions within the company. In more than a few cases, the position is with the same team they were on or even the actual position they had left! We do not yet know the extent of 2017's firings, if it can yet be called a "layoff". We do know it is worldwide again, and that in some cases whole teams of 10-20 people have been affected. And like in 2016, by June there will be an increased effort for Voluntary Separations and Early Retirements. Our last survey of ex-Intel and Eliminati members found that the median time to get a new job ranged about 8 to 9 months. Some were faster, some from 2015 even are still looking! Despite demand in some hot areas like software, it can still take quite some time to get a new position.